The Nestlé Board has decided to appoint Ulf Mark Schneider as the new CEO of Nestlé S.A., starting on 1 January 2017, and propose him for election to the Board of Directors at the 2017 Annual General Meeting. 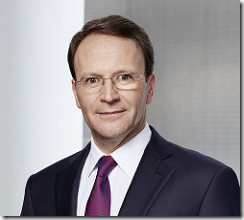 Ulf Mark Schneider, 50 years old and a German and U.S. citizen, has been CEO of Fresenius Group since 2003. He is a graduate of the University of St. Gallen with both a graduate and a doctoral degree, and also holds a Harvard Business School MBA. Fresenius, which offers high-quality products and services for dialysis, hospitals and outpatient treatments, has prospered strongly under the leadership of Mr Schneider over the past 13 years. Today, with over 220,000 employees in more than 100 countries and annual sales €28 billion, Fresenius is one of the world’s leading diversified healthcare companies. In order to ensure a smooth hand-over phase, Mr Schneider will join Nestlé on 1 September 2016 for an introductory period.